The Maya custom of building new buildings over old usually resulted in the destruction of the earlier prototypes. The Diablo Pyramid, in Guatemala, covers an earlier temple whose intricately decorated façade was carefully packed to preserve its huge stucco masks. These great faces of the Maya Sun God in its many guises once glowered across the horizon, painted a deep red and caught by the dying sun would have been visible for miles around. El Diablo forms part of a palace complex at El Zotz – just a day’s walk from the ancient city of Tikal- and dates to the Early Classic Period about 1,600 years ago. Why did they go to so much trouble? Could it be connected with the discovery of a royal tomb just in front of it? Who is the dead man, surrounded by exotic grave goods and grim sacrificial offerings? In CWA #54, we reported on the exciting new scientific research that has applied uranium series dating, a method not commonly used in archaeology, to reassess the cave art in northern Spain’s El Castillo caves. They discovered that the oldest known art of this type in Europe is even older, and was created at least 40,000 years ago. Now, in this issue, Alastair Pike and Paul Pettitt, who carried out the work, explain how they arrived at this conclusion and discuss the implications: were the stencilled hands those of Neanderthals rather than our own ancestors Homo sapiens? When did cities emerge in central and northern Europe? For long regarded as a merely a hillfort, archaeologists now believe that Heuneberg, overlooking the Danube in southern Germany, is quite possibly the first Iron Age city north of the Alps. The French Foreign Legion has inspired many a tale of adventure and heroism in the face of overwhelming odds. But what remains of their actual existence? A fort and a blockhouse in the remote heart of the Moroccan desert are providing some answers. 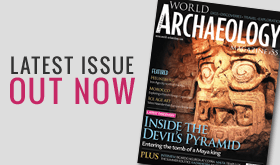 Richard Hodges foregoes his usual Postcard this issue to chat with his friend Ricardo Agurcia whose revolutionary attitude to archaeology, conservation, and communication is the driving force behind the Copán Association in Honduras. This inspirational formula may well be the blueprint for the future of cultural heritage across the world.